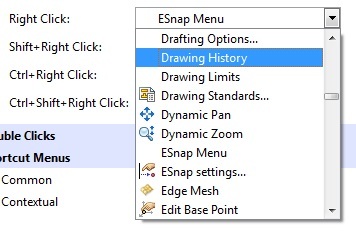 By default ESnap Menu’ is assigned to all Right clicks options. Open List of Commands and You can assign any Command to any Right Clicks option. When you select by Double click then Each command works differently. Some Command with Provide you Edit options and Some will open Properties palette of that Entity . You can also add ‘New double click action’ from right [+] tab . It will pop up a dialog box with a List of ‘DXF name’ After adding DXF name to Entity list you can Open Command Name list by double clicking on Column cell and Assign Command to Entity. Also We have option of adding Commands from ‘Command Explorer’ Simply Drag and Drop any Command to Command Name. RMB Options: When you right click inside Double clicks then we are presented with some options as below which are self explanatory. Shortcut Menu which appears in DraftSight when we do Right click can be categorize in 2 types. We will see one by one. Now Do Apply and Ok on Customize dialog box and come in Drawing Area of DraftSight. Do right click in GA make sure no command is running. This is called Default menu. Now Press Esc and Come out of Edit mode and Draw Line in GA but keep command running . After you draw a line segment and command is running press Right click you will see Command Options . Above 3 options for right click menu ‘Default Menu’, ‘Edit Menu’ & ‘Command Menu’ can be customize from Common list. Simply Expand each list and you can Drag and Drop commands from Command Explorer to it. 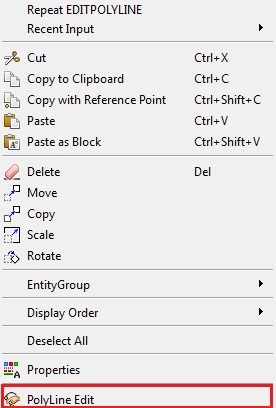 Is Command options which appears specifically to perticular command when we select entity one time and do right click. Ex. Select Rectangle with one click and do right click . 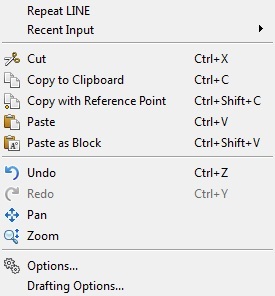 Out of all default options for right click we will see a new Command option at bottom as ‘Edit polyline’ which is contextual menu for Polyline Rectangle.